On a picturesque July Sunday, the Giants came out swinging. With the series on the line in the last game before the All Star Break, they’d get a pair of walks and a pair of singles off Livan Hernandez to jump out to a 2-0 lead. Livo was reaching for the corners but not finding them in the first, throwing six pitches to both Posey and Uribe looking for that elusive third strike call. In the third, the Giants would lead off with back to back singles from Sanchez and Huff, followed by an off-the-wall triple from Buster Posey. On the triple, Nyjer Morgan would take a difficult route to the ball, which would bounce just behind him, and back into center, letting Posey advance to third easily. Ishikawa would sacrifice him home, letting the Giants come out to a 5-0 lead after the third. The Nats would try to strike back in both the first and second, but would find themselves tripping over their own shoelaces. Nyjer Morgan would be hit to start the game, only to be erased by a Guzman double play. In the second, Willingham and Rodriguez would come aboard, only to have Morse ground into another twin killing. Stranding runners in scoring position hasn’t been a theme for the Nats much of this season, it’s either been feast or famine from the offense. The Nationals would make a push, finally, in the seventh inning. Ian Desmond would single to start the inning, and that would finally chase Madison Bumgarner from the game after 6+ of scoreless ball. Pinch-hitter Willie Harris would walk, and Nyjer Morgan would fly to left. The Giants would send out former Oriole-closer Chris Ray to calm things down. After that, the Nats would put three singles together from Guzman, Zimmerman and Dunn to bring in Desmond and Harris, and put the Giants in a bit of a tough spot. Having disposed of Ray, and his follow-up, Affeldt, Josh Willingham would face off against Sergio Romo. Romo’s vicious slider made short work of Willingham, sending him down swinging on three pitches. Pudge Rodriguez would follow on two more, flying out to center to end the threat. 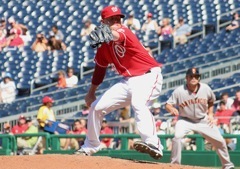 The Giants would add one in the eighth, off Drew Storen, but would score no further. That left things up to the unpredictable Nationals’ offense. In the eighth, they’d try to put a rally together, getting a couple runners on, but unable to finish against Doug Wilson. The Nats would strand a baker’s dozen runners on ten hits today. That sort of offensive frustration was not lost on Manager Jim Riggleman today, and said that losing “should leave a sour taste. We played a clean game,” but couldn’t deliver the offense. The Nats head into the All Star Break with 39 wins and 50 losses. That’s 11 games better than last year, but still 11 games under .500 and 13.5 games back of the division lead.